I would like to show you the work of Edvin Sjöberg of Gotland, Sweden. Edvin is trained as an archaeologist and industrial designer and recreates Viking knives based on examples from archaeological finds. Not only is Edvin a scholar, he is a superb craftsman. 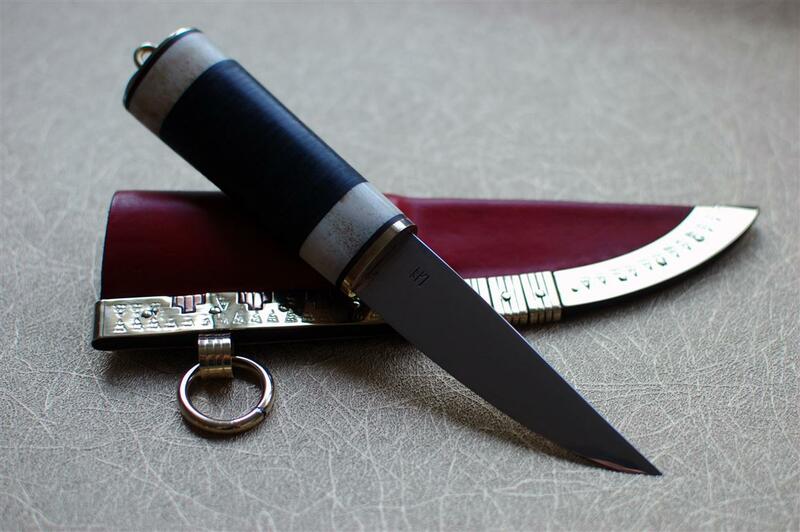 These photos are just a fragment of his work, I urge you to visit his website, http://edvinsjoberg.blogspot.com/ where you will see much more including tutorials on how he makes the knives and sheaths. Thank you Edvin! 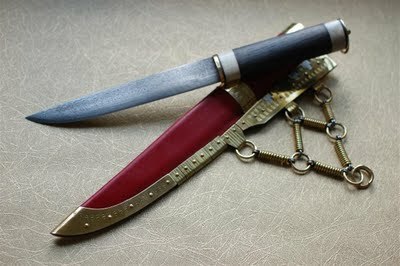 “My main interest is historical knifes and the Viking Age especially. I have a masters degree in archaeology and work with historical artifacts, real nice work! Most of the time I base my interpretations on material from Gotland, a small island in the Baltic Sea off the coast of Sweden. Gotland is famous for it’s long history and large amount of Viking Age findings. Birka (a Viking Age trading center in Sweden) is also a rich source of archaeological artifacts for inspiration. It was when I wanted to see what the archaeological stuff I’ve read about in books looked like when it was brand new that I started to fiddle about with knife making. I really liked working with my hands and watching myself grow together with a totally new skill set was fantastic. Every time I couldn’t figure out how a scabbard or a knife were made, I found sources and tried to figure out how to replicate the results. I’ve never believed it would be such a large interest for the knifes, if there wasn’t such a great response from all over the world I probably just had kept it for myself. Every time I make a new knife I try to share both the results and how I got there so more people can try it. The Viking Age knifes are first off visually impressive with the bronze plated scabbards, decorated with stamped patterns and often quite intricate constructions. When I’m handling the original knifes in the museums I’m always taken how delicate and carefully made they are. There is a lot of really interesting stylistic parameters in a Viking knife, speaking from a design point of view. How materials are used, how different surfaces join together and are styled and very decorated but still working products from a completely other time. As tools go, it’s hard to beat the knife as the permanent companion to mankind since the dawn of time. I usually try to avoid modern (electrical) tools, but for the metal fittings I have a small drill press and a belt sander in my workshop. For handles I use materials that were in use here in Scandinavia in the iron age (birch, mountain ash, alder, lime tree, horn from elk and moose) and I try as close as I am able to follow the general outlines and shapes of the originals. The metal fittings are made out of sheet metal and all buckles and rings are made from bar-stock. It is of course a great asset to be able to handle Viking age artifacts on a regular basis at work and learn from their techniques and materials. I have made both “copies” (or at least my impression on) of surviving artifacts as well as more free interpretations. 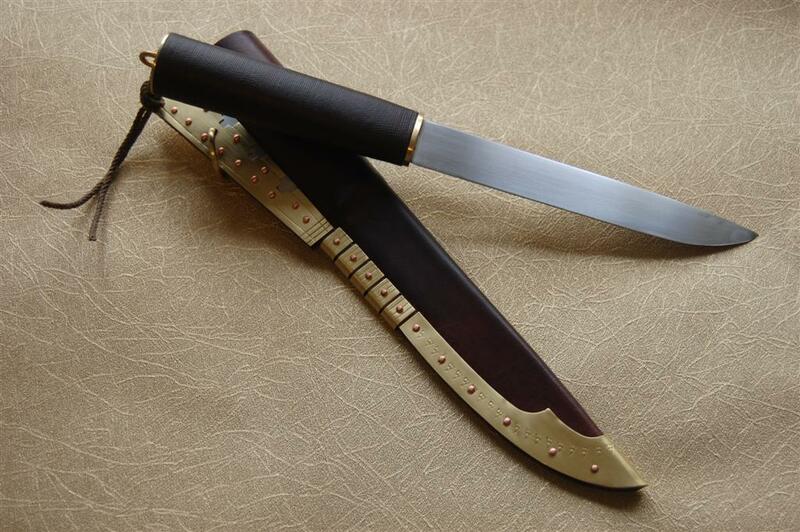 Some of the larger knives are made for historical re enactment and are blunt for steel fighting. In Viking age Scandinavia most knifes (and to some degree swords) were made of quite soft iron, steel then laminated onto the blades. I cańt say if there is any significant difference between the Scandinavian ones and surviving examples in eastern Europe. Historical metallurgy research costs a lot of money and most of the surviving knifes from the Viking age around these parts are not tested (in my knowledge). It is not always easy to find good quality blades with an distinct V-shape. Most of the modern ones are not good for iron age-knives due to the cutting angle and thinness of the blade. Most Viking age blades have a quite thick spine (up to 8-12 mm) but are angle of the edge goes all the way up to the spine. Maybe I will find a nice smith here that can make some from my drawings. The ring us used to pull the knife from it́s sheath. Viking Age knives (and traditional Scandinavian) sheaths are deep and when in use, there is not much of the handle to take hold on. 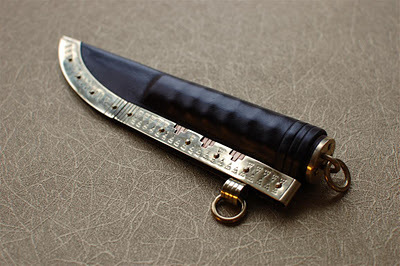 The draw ring made the retrieval of the knife from the sheath easy and could probably be used to attach a wrist strap to keep the knife in the hand on the larger examples. 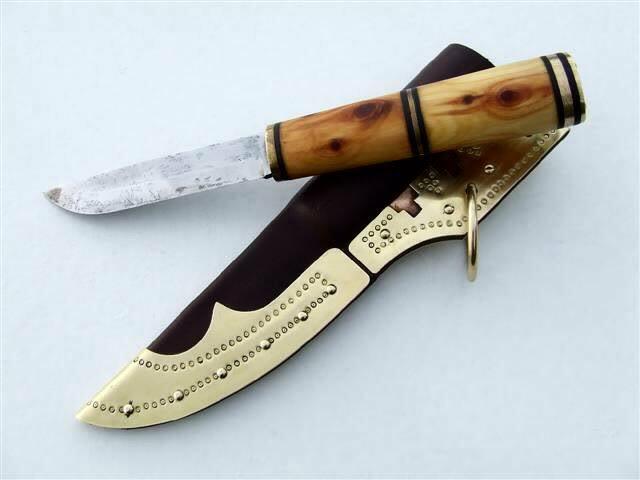 A Viking knife with leather covered linden wood-handle. Blade by Thomas Cederroth. Brass fittings, underlay in copper, copper rivets. 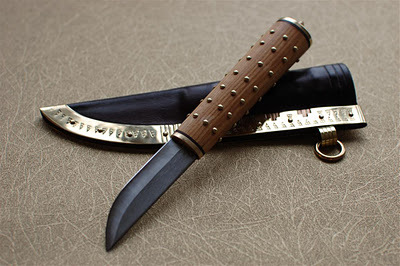 This blade from Aage Frederiksen. 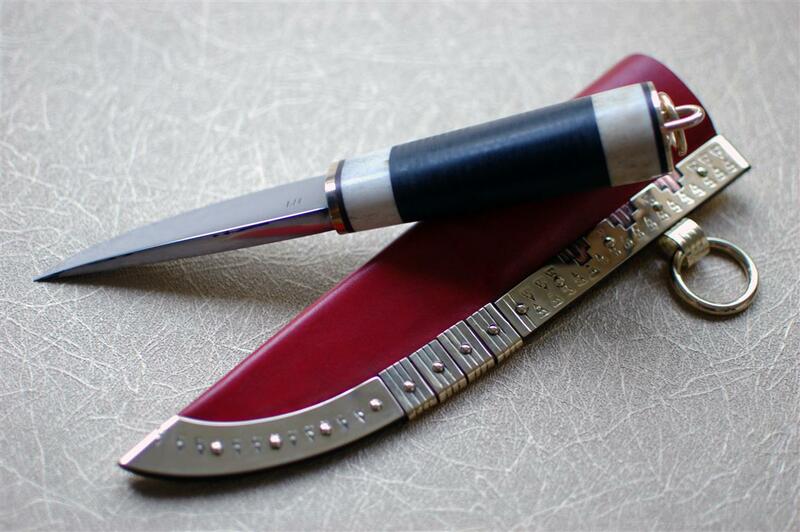 Stacked leather and elk horn handle. Polished brass fittings and underlay with bronze. Brass rivets. 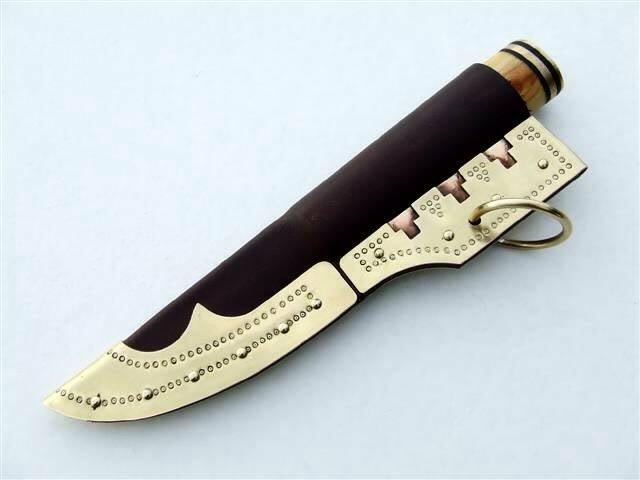 Dark brown leather sheath with polished brass fittings, copper inlays and stamped pattern. 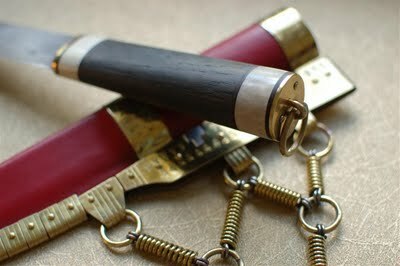 Handle in ash with brass rivets, draw ring and brass bolsters. Polar blade. 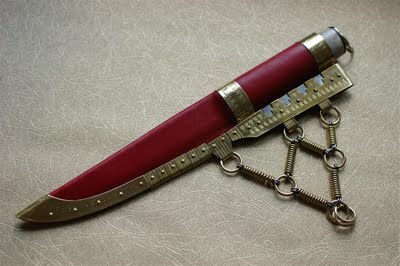 A war knife which was also ceremonial. 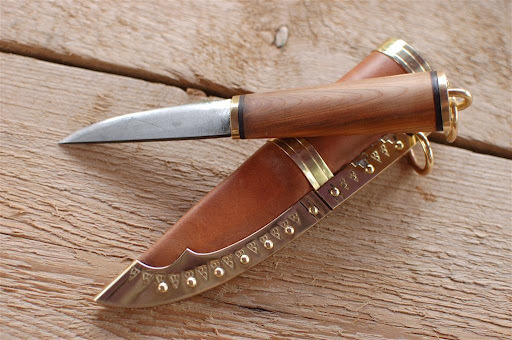 A beautiful recreation of a Viking knife.